Rubber B, the very first company to create integrated rubber straps for various Rolex, Panerai, and Patek Philippe watches, has recently introduced a brand new watchband series, specifically designed for the Tudor Heritage Black Bay, and as always, the entire line is made in Switzerland. 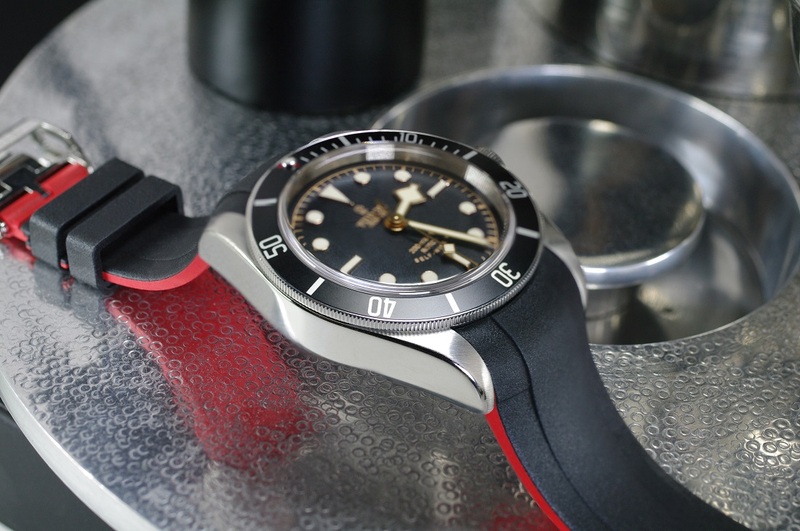 While the lug areas of the band feature the familiar Rubber B for Rolex “T-Design,” the calibrations and finishes of the new Tudor Series are actually quite unique. One noticeable difference being the outer rubber surface, which has an appealing, rugged texture in order to compliment the similarly appointed Black Bay dial. 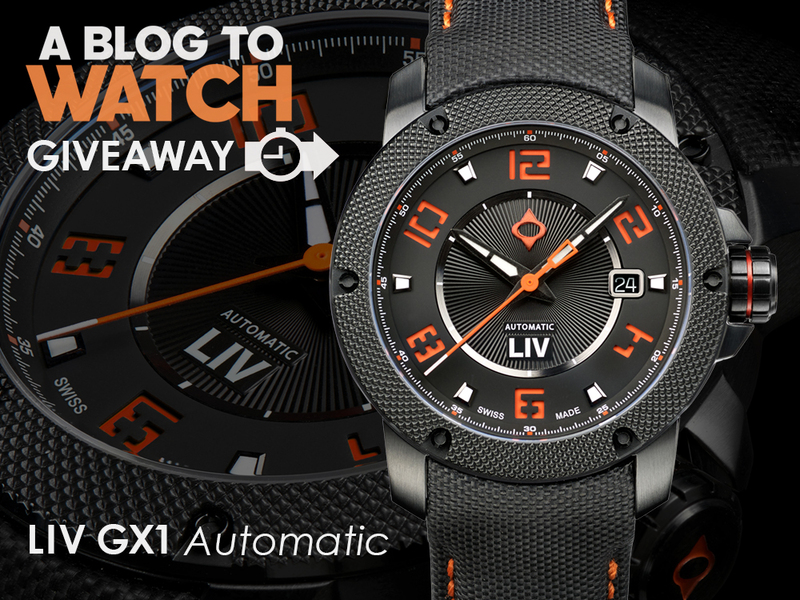 In contrast, the interior face of the strap embraces the wearer’s skin with a pleasantly smooth and supple texture. This is an extremely detailed approach, developed by Rubber B’s Swiss factory in their pursuit of high-tech styling for the most discerning clientele. Lines and levels within the new Tudor strap design have also been extended to graciously coordinate with the refined shape of the Black Bay case and its long, elegant lugs. Of course, rubber straps are not entirely new to Tudor. The Tudor Pelagos dive watch does come with an integrated OEM rubber strap option, for those who wish to enjoy that variety. 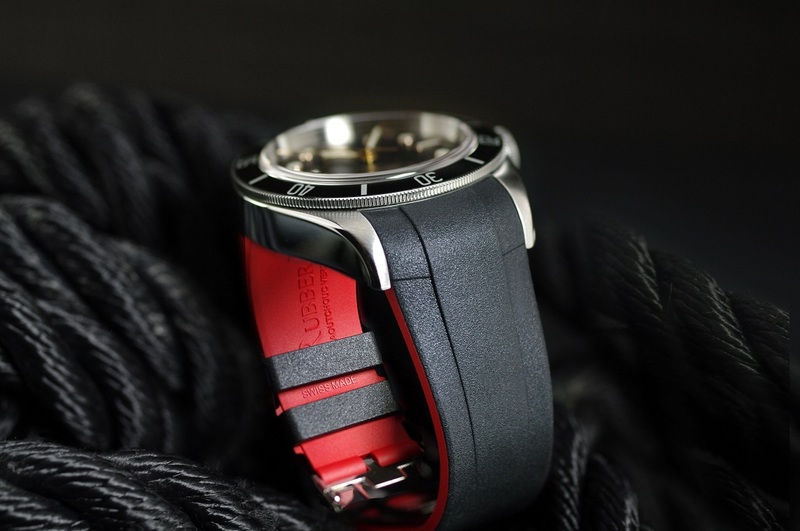 This is a great way for watch enthusiasts to customize their Pelagos according to their own lifestyle. For years, Black Bay owners were confined to the classics: OEM steel, OEM leather, or aftermarket options that tend to be low-tech. 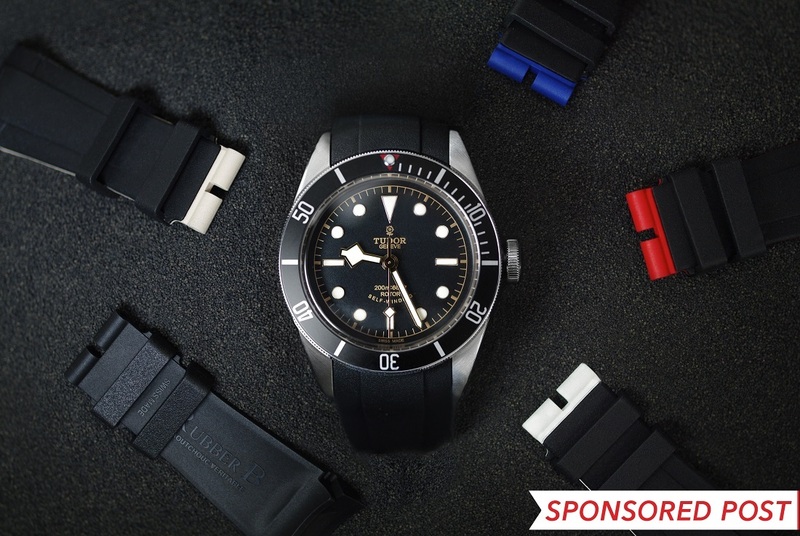 As they did with Rolex models in 2010, Rubber B has stepped in to offer a luxury alternative watchband for the Tudor Black Bay, bringing along all the latest bells and whistles available in the rubber tech field today, and those of which Rolex owners have already been enjoying from Rubber B for many years. These technologies include rotation-free “Blocked Integration” to the case, deployment clasp integration, and patented Dual-Color technology, termed VulChromatic. Blocked integration offers several benefits, such as balance and stability on the wrist. Its flush design to each element of the case and lugs is also very pleasing. As the curved end of the Rubber B strap gently envelopes the Black Bay’s radius, you would never expect there was a solid insert within the rubber mouth, housing and stabilizing the spring bar, as is demanded by its micro-calibration. The streamlined beauty of a Rubber B VulChromatic strap, defies all previous color limitations that previously existed with natural vulcanized rubber. You will find no glues, bonds, paints, or otherwise fictitious color presentations in a Rubber B strap. You will also not find any chemicals or sub-par materials such as silicone in the mix. Pure, natural, soft and supple Rubber B VulChromatic straps are two rubber masses of differing colors and textures, which have been fused from their liquid state. This allows two rubber masses to permanently function as one, with limitless flexibility and range of motion, never separating or loosing their seamless and uniform bond. The new Rubber B for the Tudor Heritage Black Bay is 100% developed, manufactured, and hand-finished in Switzerland by leaders in the luxury horology industry. 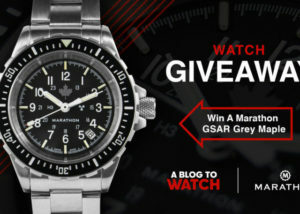 Priced at $250.00 USD, this series is compatible with both Standard and Chronograph models. 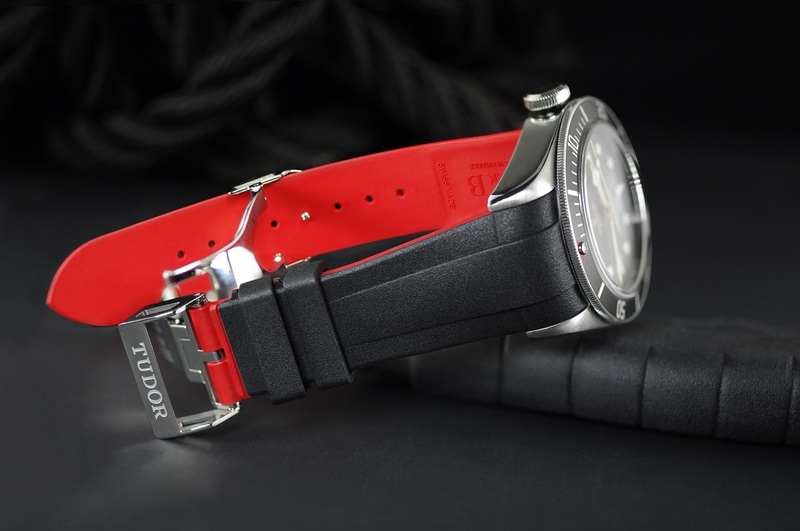 At this time, Rubber B does not provide a buckle with their strap, as it has been designed to mount the original OEM deployment buckle that is provided by Tudor with their leather strap models, and which can also be purchased directly from Tudor retail boutiques. Any standard, non-OEM 18mm Tang Buckle is also compatible with the Rubber B for Tudor, if a client prefers a different finish for his or her own unique style. RubberB.com is the official brand website for e-commerce retail purchasing in the USA and abroad. 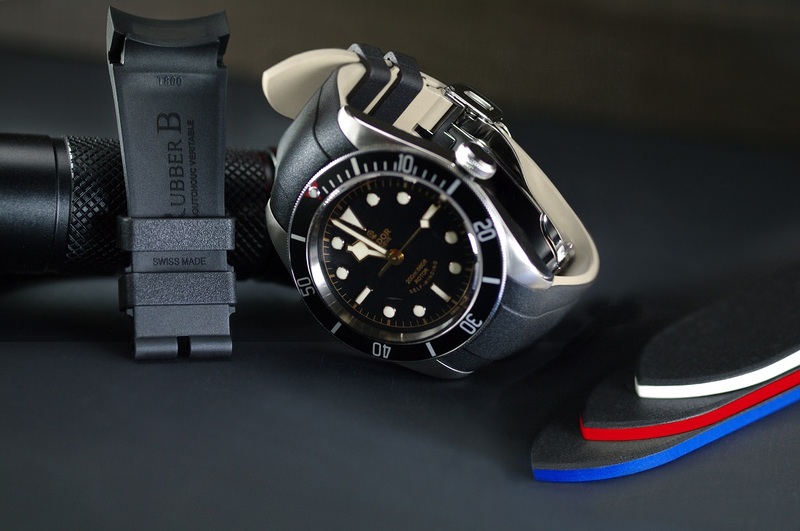 The Rubber B for Tudor Heritage Black Bay and all other products can be purchased directly online. Various photos and color combinations can be found on independent social media posts under #rubberb and at @RubberB_Official on Instagram.